What's in the book? Here's a list of contents. What delivery time? P&P? See under the input fields. Want more than two books? You'll get more than one parcel (postal costs rocket if three or more books per parcel). Email me if you want to buy more than eight books. Want it digital? You're out of luck - click here for why. For postal costs, see below. They will be calculated and added to your order at the next stage. You can review your order before sending payment. Delivery times: the next despatch date is 25 April. Royal Mail should deliver it within 3-5 working days after that (second class in the UK, International Priority for overseas). Rest of world: £5.60 each. Small print - what I do with your details: I will send you about 10 brief emails a year - tips, new downloads, details of Courses, etc. I won't pass on your details, and you can unsubscribe any time. 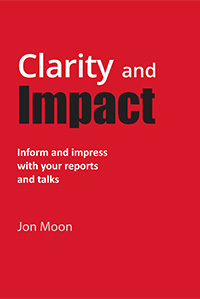 Updates are sent with jon@jmoon.co.uk as the "From" address. Maybe add this to your Contacts to ensure you get it. And if you are into 'GDPR', here is my Fair Processing Note. Why not available in digital format? The book has almost 500 mock-ups. It was hell to typeset in a way that looks smart - and after all that, the last thing I want is for Kindle to throw the whole thing out of whack.